As the title implies this walk snakes its way across the City of London beginning at Waterloo Station and finishing near Liverpool Street Station. There are plenty of places to eat here, you can go on to explore Spitalfields or Broadgate, two very contrasting areas, undertake some research at the Bishopsgate Library or catch bus 149 or 242 to the Geffrye Museum (closed Mondays). On the way there are some famous and not so well known places to see. The distance is about 3 miles. You can shorten the walk by starting at Blackfriars Station. Waterloo Station was rebuilt 1900-22 when it was opened by Queen Mary. The main 'Victory Arch' entrance serves as a war memorial to staff killed in WWI. There is a statue on the concourse of artist Cuneo - Can you find his trademark mouse? IMAX has the largest cinema screen in the country (20m x 26m). The Schiller International University is housed in the former Royal Waterloo Hospital for Children & Women (closed in 1936). First constructed in 1823 it was rebuilt in 1905 in red brick with terracotta dressings and a ceramic facade. One of the 'Waterloo' churches this was built in 1823-4. It was bombed in WWII and restored by Thomas Ford in 1950. The Nautical School was founded in 1915 and moved into the Stamford Street premises in 1965. This had been built in 1820 for the Benevolent Society of St Patrick and was occupied by the London School of Printing 1921-1965. The portico was part of an 1823 Unitarian Chapel. The Doggetts Coat & Badge pub commemorates an annual boat race instigated by Thomas Doggett, a comedian and joint manager of the Drury Lane Theatre. The walkway under Blackfriars Bridge has tiled panels relating to its design and construction. The road bridge designed by Robert Mylne was the second to be built in the City in 1760-9. A new bridge was built in 1860-9 designed by Joseph Cubitt and H Carr. It is supported on granite piers representing pulpits to recall the Blackfriars Monastery. It was opened by Queen Victoria along with Holborn Viaduct and widened in 1907-10. There were two railway bridges. Only the abutments and columns of the western one, designed by Joseph Cubitt and F T Turner for the London Chatham & Dover in 1862-4, remain. The eastern one of 1866 was by John Wolfe Barry and H M Brunel for the Holborn Viaduct Company and is still in use. This wedge-shaped pub was built in 1875 but remodelled in the Edwardian period by Henry Poole and H Fuller Clarke who added the Art Nouveau elements and depictions of the Black Friars. Playhouse Yard to the right recalls the location of the Blackfriars Playhouse associated with Shakespeare. Just beyond this is the Apothecaries Livery Hall. 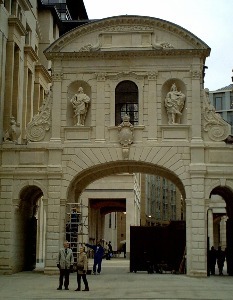 The site was purchased in 1632 and the building reconstructed in 1688 after the Great Fire of 1666. The premises are largely unchanged except for some modifications in 1779 & 1927. A plaque on the right records the monastery. The Dominican community was founded in 1221 and obtained this site in 1278. It was dissolved in 1538 and the buildings largely demolished, including the church. A new parish church of St Ann was built during the reign of Mary but this and the remaining monastery buildings were lost in the Great Fire. The St Ann's Vestry building serves as offices for the 'Friends of Friendless Churches'. Shakespeare bought a house which had been the Blackfriars Gatehouse here in 1613 for £140. There are some monastery wall fragments in the former churchyard. Wardrobe Place to the right was built on the site of the King's Wardrobe in 1720. Numbers 3-5 remain but parts were redeveloped in 1982. The former choir school on the left with its unusual decoration is now a youth hostel. Just beyond this go along Deans Court. At the end cross and go left along Ludgate Hill then right into Stationers Hall Court. The company acquired a hall in 1606 but this was destroyed in the Great Fire and rebuilt in 1673. It was refronted by Robert Mylne in 1800 and largely escaped war damage although one wing was destroyed and restored in 1957. St Mary-le-Bow burned down in the Great Fire and was rebuilt by Wren 1670-3. It was bombed in WWII and rebuilt in 1956-62 but retains its Norman crypt. Go right at Cheapside, right at Queen Street and left through Pancras Lane. This striking building was designed by James Stirling and occupies the site of the former Mappin & Webb premises. The bands of stone from Gloucestershire and Australia represent pin-striped suits and the colourful ceramic interior silk ties! A clock and terracotta panels from the old building have been incorporated. Frederick's Place to the left has terraced houses built by the Adam brothers in 1776. St Olave Church was rebuilt by Wren in 1670-6 after the Great Fire. It was demolished except for the tower in 1888. There are a number of things to see here. St Lawrence Jewry Church was founded in the 12th century and rebuilt by Wren in 1671-7 after the Great Fire. It was damaged by WWII bombing and rebuilt in 1954-7. The Guildhall Art Galley has the remains of the Roman Amphitheatre in the basement (this is also marked out in the yard). The Guildhall itself can be visited when not in use. The Library and Clock Museum are within the complex. The Old Butlers Head pub is located in this alley. St Margarets Lothbury Church of 1440 was rebuilt in 1686-90 by Wren after the Great Fire. The church of St Botolph was rebuilt in 1571-2 and survived the Great Fire. It was subsequently rebuilt in 1725-8 and restored after WWII bomb damage. The adjacent school room is mid 19th century and had Coade Stone figures of charity children. Opposite is an unusual building that was designed as turkish baths. It is much larger than it looks as much of it is below ground. If you are interested in comparing the modern city with that of the Romans the Museum of London sells a Roman London map.